Create page groups and categorize pages according to filters defined based on any metric you want. Discover how to create your segmentation. If you're reading this page, you've understood how segmenting pages into page groups based on pertinent metrics will help you read your analyses and extract actionable conclusions from your data. Below, we go over the basics on how to create a custom segmentation by building the page groups you want to use to view your data. We'll first create the segmentation, which acts as a container for the page groups. Then, we'll create the individual groups of pages that segment the URLs in your website. Next, we'll define which pages go in which groups. Finally, we'll make sure that the pages are distributed correctly by checking the pages included in the page groups. Click on the "+ Create segmentation" button at the top of the page. This will bring you to the three-step process to creating a segmentation. To begin, decide how you want to create the new segmentation. This option allows you to copy a segmentation that you already have (in order to modify it later), or to upload a segmentation that you downloaded from another project or received from someone else. Select "From existing set or import" and click "Continue". Copy existing: Create a copy of a segmentation in your project. A drop-down list of your existing segmentations will appear below. Select the existing segmentation that you want to copy and click "Continue". Upload file: Upload a segmentation that you have saved on your computer. An upload zone will appear below. Drag and drop your segmentation onto the upload zone, or click on it to open a standard upload window in order to navigate to the file on your computer. Paste JSON: Paste the JSON text of a segmentation that you copied from somewhere else. A text field will appear below. Paste the full text of the segmentation and click "Continue". Note: You might see a warning if you're using a segmentation that is not based on the URL. It's okay. 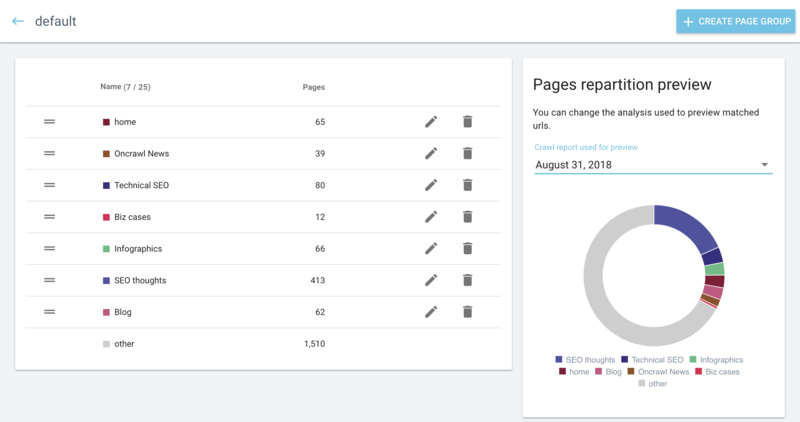 We're just reminding you that if you segment your pages based on data that isn't available in a report, we'll hide the segmentation for that report. Enter a name for your segmentation. This is the name you'll see listed in the segmentation menu at the top of the crawl results, so pick something that helps you identify this segmentation. You can change this later if you change your mind. Click "Create segmentation." This will take you to the segmentation page for your new segmentation. See below on how to modify the segmentation to fit your needs. Select "From a field automatically" and click "Continue." URL first path: create a page group for each item that occurs in the first directory position after the domain in the URL. This will re-create the OnCrawl default segmentation. This option will create an empty segmentation (all URLs will be listed as "Other") for you to modify in order to set it up exactly the way you want it. Select "From scratch" and click "Continue". If you've just created the segmentation you want to modify, you'll already be on the segmentation page for this segmentation. If you want to modify an existing segmentation, on the Segmentation page, click on the name of the segmentation you want to modify. Preview how pages in previous crawls break down when using this segmentation using data from previous crawl. Change the order in which the page groups are listed. Click on "+ Create page group" at the top right of the page. Enter a name for the group of pages. For example, if you're creating groups based on inlinks range, you might want to name your first group "0-50 Inlinks". Choose a color that will represent this group in all of the OnCrawl charts. Decide where the new page group will be listed compared to the other page groups. You can place it first, last, or after another specific group. This will take you to the page where you tell OnCrawl what pages to put in this group. If you've just created a page group, you'll already be on the right page to set up the pages that will go into this group. 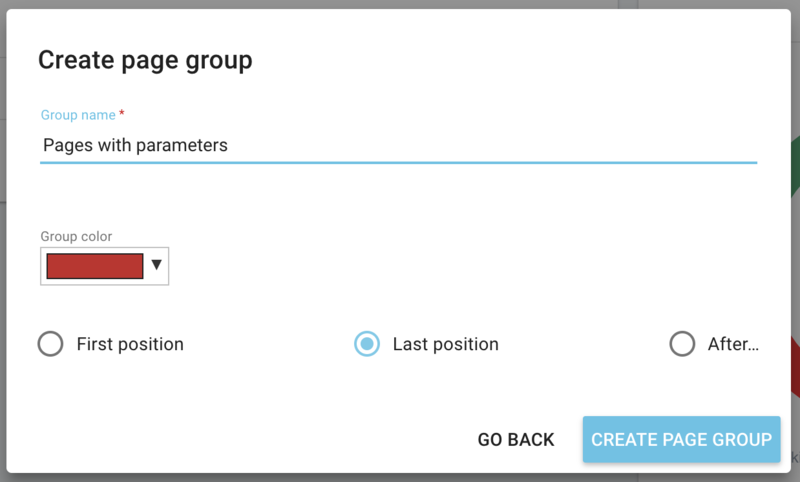 If you want to modify an existing page group, on the page for the segmentation that lists the page groups, click on the name of the group you want to modify. This filter takes all pages with a URL and puts them in your page group. In the preview on the right, 100% of the circle will be the color of the current group. The group "Other" will exist, but no pages will be in it. In the section "Definition for...", use the OnCrawl Query Language to filter the URLs you want to place in this group. Select a metric in the first drop-down menu. Type part of the metric you're searching for to narrow down the options. For example, to create a group of pages with 0-50 inlinks, we'll click, type "Inlink" and select "Range of Inlinks". In the second drop-down menu, select the way you want to evaluate the metric. To create a group of pages with 0-50 inlinks, we'll select "is". In the final field, enter the criteria you want to use to evaluate the metric. To create a group of pages with 0-50 inlinks, we'll select "0-50". You can use multiple metrics at a time to define exactly the page set that you want. The option "Refresh matching URLs" updates the URLs lists below. Checking the pages that are included in a page group is a necessary step, particularly if you have page conflicts among your groups. If you're not already editing the page group, click on it's name to modify it. Below the OnCrawl Query Language that filters the pages in this group are the lists of URLs that will let you check the pages in this group. Click on the name of a list to view it. These are the URLs that are placed in the group, based on the filters set up above. You can add columns and sort by any column in order to make sure that the URLs you want appear here, and that the URLs you don't want in this group don't show up in this list. These are the URLs that do not appear in any page group in your segmentation. These pages are placed in the category "Other". You might need to create another page group for these pages, or you might want to adjust your current groups to include them. These are the URLs that currently appear in more than one page group in your segmentation. A drop-down menu at the top of the list lets you look at conflicts with each other page group in the segmentation. If you have pages in this list, it means your page groups overlap. You should modify the definition of your page groups so that each page is listed in one page group and only one group.